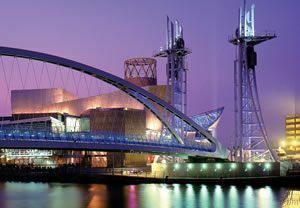 Situated in the north west part of England Manchester is an administrative center of metropolitan borough Greater Manchester. Its population, including suburbs is over 2 000 000 people. Manchester is the fourth largest city in England following London , Birmingham and Liverpool. Manchester is a cosmopolitan city with rich cultural life and even richer history. The city is the main football center of England. It is famous for its football teams: “Manchester United “and “Manchester City “ . The biggest attractions in Manchester are the stadium of Manchester United - “Old Trafford” and the Manchester United Museum. There are many, museums, galleries, theatres, elegant restaurants and excellent trade centers. Main attractions of Manchester are the Centra l Library and the Theatre, Manchester Museum, The Museum of Science and Industry, the Museum of Transport, the Art Gallery Cornehouse , Castlefield - the remains of a Roman settlement, the Manchester Cathedral and Town Hall, Chinatown and others. Interesting place to see is the University of Salford in Manchester, who attracts students from all over the world. The university is one of the best in North England. This is the city with most students in Europe. Please mind that rates vary depending on booking dates.